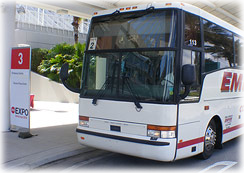 Empire Coach Line features a fleet of the finest European Charter Buses in Central and Southern Florida. Our commitment to safety combined with superior service, truly sets us apart from the competition. We invite you to try us out. Come and get away with us. Our charter buses are fully equipped with all the necessary features to make your local or longs distance trip comfortable, relaxing and enjoyable. Our drivers are professional, courteous, DOT certified, and well-trained for local and long distance charters. Our company is equipped with all state and federal required licensing including $5 million in insurance. Contact us today for more information or to obtain our competitive pricing for your special events. Call us in Orlando at 407.888.2624 or in Miami at 305.720.2667 to find how we can help you with your charter bus rental service needs or click here to submit your quote request. 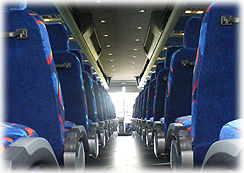 Empire Coach Line has been family owned and operated since its beginning. The safety of our passengers and providing superior service has always been the core values of the company. Viewing maintenance as an investment, hiring qualified drivers, and following our core values above all is what has made Empire Coach Line successful. For your safety we make it possible to maintain constant contact with operations on a 24-hour a day basis. The owners, management, and operations staff are accessible to our clients around the clock to address any concerns you have about your trip. Empire Coach has a proven track record in successfully coordinating and organizing shuttle services for tradeshows and conventions. Whether your team is planning on moving 20 or 20,000 attendees, we can help! Our management staff can develop and manage your scheduled routes or simply provide total program supervision for your existing operating plans. Every child looks forward to a field trip. And every parent looks forward to their child's safe return. Empire Coach Line provides both the fun ride for the kids and the priceless assurance of safety for parents and school staff.